A few weeks ago, I was walking over the bridge looking at the reflection of the morning sky in the canal. In my heart, I thought about the moment God made the creative decision to put reflection on the face of the water. My thoughts about His motivations caused love to overflow in my heart. Creation is the expression of His love. I am water-logged with thoughts about the expressions of His love through creation. For a long, long time, I have been in love with the romance and depth between Ruth and Boaz. I shut my eyes and think of what it was like for Boaz to wake up with Ruth on the surface below him. Where she was waiting for him to see her. To accept her marriage proposal. In the blue glow of midnight. I think about the months before as she walked Boaz’s fields collecting barley. Under his promise that she would be safe in his meadows. Their love story began in fields where Boaz first noticed Ruth. I have to think that the fields brought out the golden amber in her skin. I have to think that she glanced at him through the waving field that was the distance between them. I think about their love in light of blue of night and amber of day. We express our love in the midst of His creation. Ten years ago I read Donald Miller‘s Searching for God Knows What. There is this mind blowing chapter that envisions Adam and Eve’s love story. He suggests that Adam was a sort of lonely naturalist naming and categorizing the planet’s animals for about 100 years before he met Eve. All that time, Adam did not find someone like him that he could connect with. When Adam finally sees Eve for the first time, Miller describes that Adam was seeing a person who was like him, only more beautiful, and smarter than him in the ways of relationships. He must have thought to himself that she was perfect, and after a few days of just talking and getting to know each other, they must have fallen deeply in love. This is all among God’s creation. They fell in love in the midst of His creation. Driving one afternoon, I listened to Dr. Bob Barnes and his guest ponder woman as night and man as day. It’s a deep thought that just like the Spirit hovered over the waters and carved out darkness and light, He carved out of His image woman and man. Just as he named the light and darkness to complete the first day, He created Adam and Eve to make something really good together. Something complete. Out of His creativity and love. Miller says that sometime after Adam and Eve fell deeply in love, he must have gone on a long walk with God and thanked him. When Boaz expresses his love to Ruth for the first time, he called her blessed of God. That’s a kind vertical and horizontal gratitude. When I look at the sky’s reflection in the water, I am humbled and inspired and amazed and entirely grateful for the expression of His love in creation. 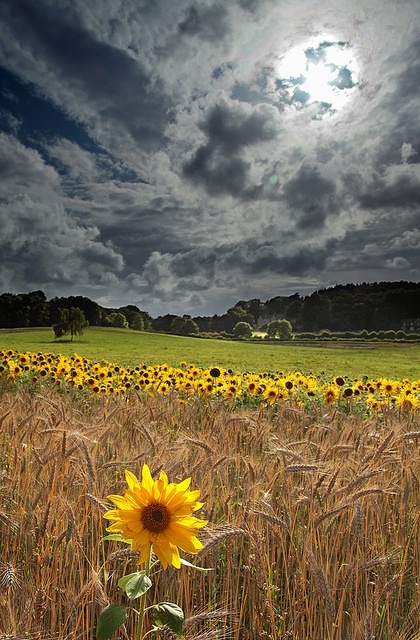 Thank you to Tony Gill for Sunflowers at Arne.